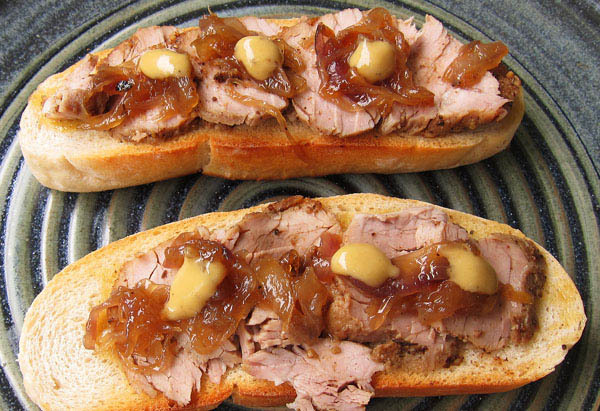 This post came about serendipitously via a friend’s request for a recipe for Pork Loin with Whiskey Caramelized Onions on Baguette that Antoni Porowski prepared on Queer Eye‘s reboot on Netflix series 1; episode 5. Antoni is the Fab 5’s food and wine expert who breezes through some easy food preparations for the novice cook faced with entertaining at home. There are no recipes mentioned nor much attention to “how to” procedures. This has stirred up some speculation about Antoni’s actual cooking acumen, but he has a captivated legion of fans, a cookbook coming out in 2019, and says he’s opening his own restaurant in New York. You can’t argue with success! I’m always up for a cooking challenge, so I read some comments about this particular dish from the series and put together the recipes for the required components. I decided to include a honey mustard sage vinaigrette that was not featured in the series, but adds a much needed taste bite to bring the whole concept to life. As pictured, tender thinly sliced fennel scented pork tenderloin is layered on toasted slices of ciabatta smeared with a sage honey mustard vinaigrette. Topping the pork loin are deeply caramelized onions that, while not quite as easy as Antoni’s appeared to be, were well worth the extra effort. All said and done, my friend’s hunch turned out to be a perfect addition to a lively mid summer supper buffet. Place the fennel seeds, peppercorns, and salt in a spice grinder and grind until powdery. Pat the tenderloins dry with paper towels. Place on a tray and rub each tenderloin all over with the seasoning rub. Place an oven proof a cast iron skillet or Dutch oven over medium heat on the stove top. Add the oil and when hot add the pork loins and brown on all sides. Then transfer the browned tenderloins to the oven and roast for 30 to 35 minutes. Remove from the oven, loosely cover the pan with foil and set aside to cool. When you are ready to serve, thinly slice the pork into medallions. While the pork is roasting you can prepare the Whiskey Caramelized Onions. Place the butter and olive oil in a large skillet over medium heat. Swirl the melting butter into the oil and than add the yellow and red onions, salt, and pepper. Stir until evenly distributed and continue to saute, frequently turning the onions, until they are soft and have turned a deep caramel color. Timing will vary, but about 10 to 15 minutes should do it. Then stir in the sugar and add the whiskey. Continue to cook until the whiskey has evaporated and the onions have a moist lacquered like sheen. Transfer to a container and set aside to cool. Place the mustard, mustard powder, turmeric, sage, garlic ¾ teaspoon salt, pepper, honey, cider vinegar, and balsamic vinegar in a small food processor and whir until the ingredients are combined. Then with the motor running add the oil in a slow steady stream until the vinaigrette is thick and smooth. Taste and add salt if needed and whir until completely mixed into the vinaigrette. Transfer to a jar, cover with lid, and refrigerate. 4 to 5 ciabatta cut into ¼ inch slices lengthwise and toasted in the oven until just lightly browned around the edges. Smear a thin layer of the vinaigrette on each slice of toasted ciabatta. Top the ciabatta with sliced medallions of the pork tenderloin and add clusters of caramelized onions on top of each slice. Add a small dabs of the vinaigrette atop of the onions and serve. Here in Thailand fruits are often incorporated into salads as well as to savory dishes.The sweetness of fruit combined with some saltiness, bitterness, and heat from chilies upends the whole idea of what salads are or what they might be. And don’t limit your fruit choices to just tropical ones. Summer and fall fruits further north will also shine with a whole new range of flavor bites from Asia. I have used the Thai Basil Cashew sauce/dressing from my previous post for this salad. 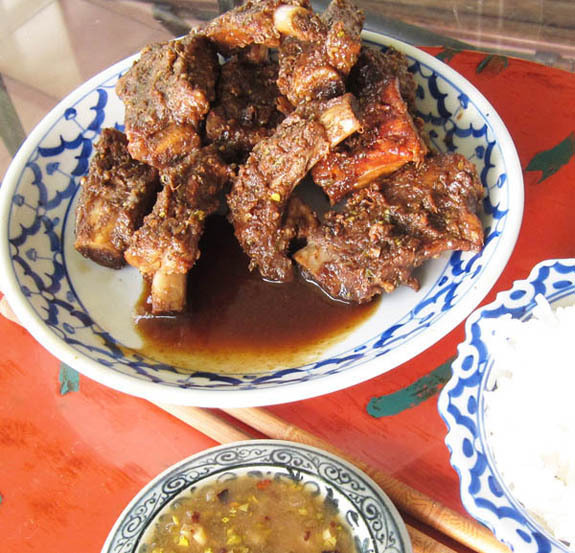 This sauce includes the pillars of traditional Thai flavors; sweet, sour, salty, spicy, and bitter. An ideal combination of flavors that will lighten, spice up, and cool down some of your summer meals wherever you live. The Thai pineapples I’ve used in this recipe are considerably smaller than those you find in the west. 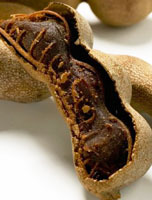 They tend to be very sweet, tender, and much more flavorsome, and well worth seeking out in Asian markets. They are often sold already prepared and ready for eating too! Prepare the Thai basil cashew sauce (see recipe here) and Thai sweet chili sauce in advance. Prepare and grill the chicken fillets and pineapples an hour before you intend to assemble the salad. Combine the oil, lime juice, and salt in a shallow tray and stir to combine. Add the chicken fillets and turn them over several times until they are covered with the marinade and set aside for one hour. Fire up the grill or grill pan until very hot. Place the chicken on the grill, or in the grill pan, and grill until the fillets are well marked. Then turn the fillets and grill until well marked on the other side. Then turn the fillets once again placing then at at 45 degrees to create a crisscross grilling markings on the fillets. 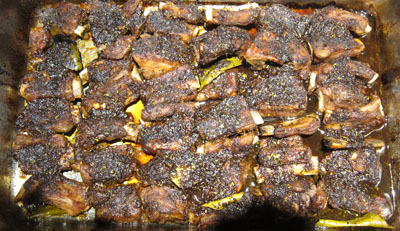 When marked remove the fillets to a plate and set aside. Roll the pineapples in the marinade and place them on the grill, or in the grill pan, and grill, turning as needed until they are marked on all sides. Remove and set aside. Place carrot julienne, Chinese cabbage, sliced radicchio (or red cabbage), and sliced shallots in a medium bowl and toss to combine. The mixture will resemble what we call a slaw in the west. Cover and refrigerate until you are ready to serve the salad. Slice the chicken fillets at a 45 degree angle across the grain of the meat and set aside. Cut through the grilled pineapples, making thin rounds, and then cut the rounds in half, and set aside. Spoon the Thai sweet chili sauce over the chilled prepared salad (slaw) and toss until evenly coated. Set out individual shallow salad plates and mound the dressed salad (slaw) in the center of each plate. Arrange slices of grilled chicken and grilled pineapple slices alternately across the top of the slaw. Garnish with a few sprigs of coriander leaves, and a fresh whole basil leaf. 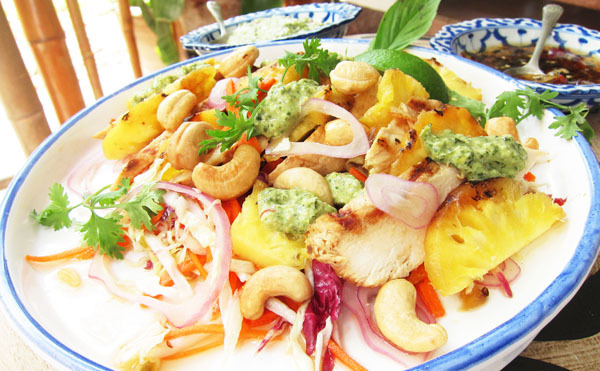 Top the salads with cashews and add a slice of fresh lime to each plate. Serve with a bowl of extra Thai basil cashew sauce on the table. 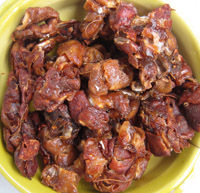 Place the red chilies , green chilies, and garlic in a small mortar and grind to a pulp. 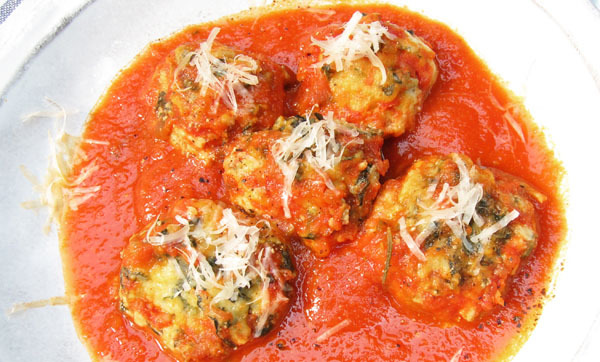 Malfatti, which loosely translates as “poorly made” in Italian, are billowy dumplings of ricotta and spinach. Essentially gnocchi, but without the dough casing. A wonderful choice for a gorgeous light meal that is sure to satisfy even die hard meat sauce lovers. Malfatti speak for themselves. Unlike gnocchi, there is no fiddling about making perfectly shaped dumplings. These have a very rustic homemade allure that harkens back to 17th century northern Italian cooks in the countryside. Malfatti can be steamed, boiled, sauted, or gently cooked in a simple tomato sauce. I make my own ricotta (see recipes here) paired with the simplest tomato sauce (see recipe here) made with imported Italian tomatoes or tomato passata, fresh Italian tomatoes which have been passed through a food mill to remove the skin and seeds. Imported passata is readily available. To a passata just add onions, garlic, salt and pepper, and olive oil and you have the simplest of red sauces made in no time. Heat the oil in a skillet over medium high heat. Add the spinach and saute just until the spinach has wilted, about 1 minute. Transfer the spinach to a paper towel to absorb excess water and set aside. Place the ricotta in a mixing bowl and add the wilted spinach, egg, ¾ cup of Parmegiano-Regiano, salt, pepper, nutmeg, and flour. Fold the ingredients together until just combined and coming together. Cover the mixture and refrigerate for 30 minutes. This will make the malfatti easier to form. Then scoop out a generous tablespoon size portions of the mixture and form into elongated egg shapes without being too concerned about their uniformity. Think malfatti! Place them on a parchment lined tray, cover, and refrigerate until you are ready to cook them in red sauce. Warm the red sauce and pour a cup or so in a baking dish. Then add the malfatti to the dish and add more sauce to nearly cover the malfatti with only the top exposed. Add the dried chiles if using and transfer the baking dish to the oven and bake for 20 minutes. Open the oven and add the remaining ¼ cup grated Parmigiano over the tops of the malfatti. Turn the baking dish for even baking and continue baking until just lightly browned, about 15 minutes. 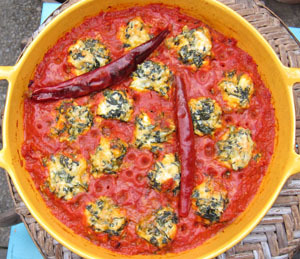 Serve the malfatti as pictured in a pool of red sauce along with a mixed greens salad and some crusty bread.